Here at Photofeeler, we sometimes get this question — particularly in regards to the way so-called “highly attractive” vs. “unattractive” people rate others’ attractiveness. It is an interesting — albeit loaded and complex — idea. 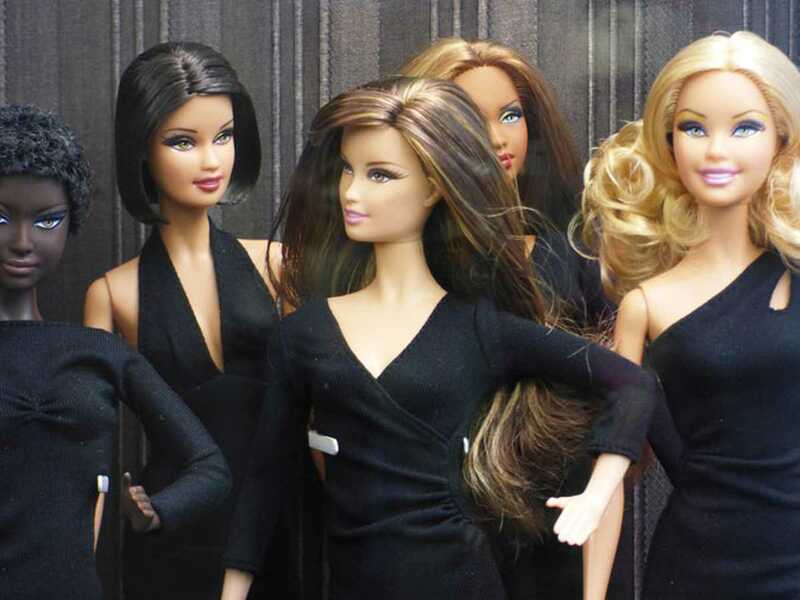 Does an exceptionally beautiful woman see men differently? Is a less physically attractive person likely to have a more generous perception of others’ physical attractiveness? We decided to put these hypotheses to the test. So how do you figure out — mathematically — whether one’s own attractiveness affects their ratings of others? First of all, let’s address the nebulousness of the concept of attractiveness itself. Some people might argue that a person’s physical attractiveness cannot be definitively measured at all as it is “in the eye of the beholder.” I disagree only partially. Statistical significance (the consensus of a large and diverse enough group to act as a proxy for “everyone”) can reliably put a number to almost anything. It will always, however, include exceptions. For instance, the Dutch people are statistically taller than Americans, but you can find a Dutch man who is shorter than an American man. Likewise, a person may be statistically “unattractive” whereas their partner rates them off the charts in physical beauty. It is not to say that their partner is “wrong”! It’s just that statistically significant agreement can be tremendously useful for answering questions like the one we’re addressing today. Truth be told, a “fair” rating might only be given after extended in-person interaction — such that the person has been seen in a large range of lights, angles, emotional states, etc. But for the purpose of this study we used what we had — the average of a voter’s own photo rankings — to act as the best proxy available. Here’s a helpful perspective: even the most attractive users who are voting on you are not exactly who you want to date. They are likely not in a 25-mile radius of where you live, for instance. Rather, they act as a proxy for the exact women or men you want to attract and date. You simply want a sample of opinions that correlate well with the opinions of the actual people you’re interested in. So answering this question is about sussing out correlations. In other words, are the opinions of an unattractive woman and an attractive woman as well-correlated as the opinions of two attractive women? 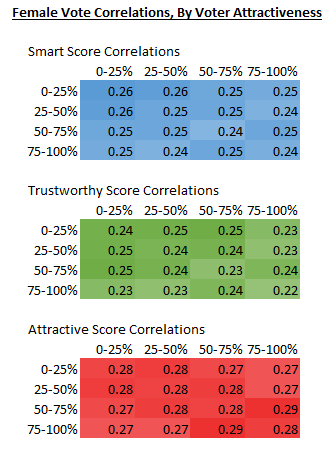 We could find no statistically-significant difference between the average correlation of two attractive women’s votes (top 25%) and the average correlation of one attractive and one unattractive woman’s votes (top 25% and bottom 25%). So essentially, a sample of unattractive women’s votes is as good a predictor of attractive women’s opinions as a sample of attractive women’s votes. There is no difference between an attractive woman’s ratings and an unattractive woman’s ratings. Notice in the chart below the ranges of voter’s attractiveness: 0-25, 25-50%, 50-75%, 75-100% and how they correlated with each other. Correlation is expressed as a number between -1 (being a perfect negative correlation) and 1 (being a perfect positive correlation). So a woman’s attractiveness did not affect her voting behavior in any categorically-consistent way. There is, however, one grouping that does: age. As you can see below, older women are a pretty good proxy for younger women’s opinions, but not perfect. 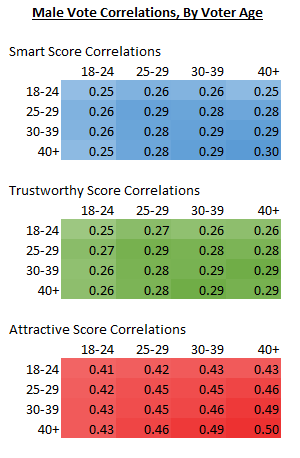 Additionally, women aged 25-39 are in much more agreement with each other on their judgments of attractiveness. Younger and older women tended to be more spread in their opinions. 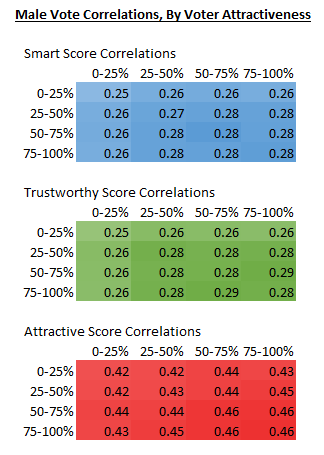 Men disagree as much as women in their perceptions of “smart” and “trustworthy,” but men are far more in agreement about which women are attractive — a correlation of 0.28 for women rating men vs. 0.45 for men rating women. In regards to the men’s own attractiveness and how it affected the ratings they gave women, there’s a slight (nearly negligible) difference between an attractive man’s ratings and an unattractive man’s ratings. So while they are not exactly the same, the groupings are still a very close substitute for each other. Across the age spectrum, however, the difference is a bit larger. 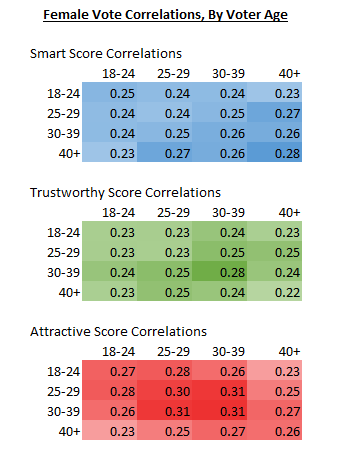 Our analysis shows a trend that men agree more about how smart, trustworthy, and attractive women look as they get older. But since older men actually predict the scores of younger men better than younger men themselves, we know that the average opinions are similar — just with more variation among younger men.